Indian Cooking Challenge for June, saw us making yet another new type. After baking I thought we should attempt at a new type of dish and what can be more new than making a pickle. Well at least for me it is going to be first. Pickle making is the most common ritual one can find at home out, still I have only assisted in making a pickle, never completely made it myself. I guess my idea for the new challenge always comes while chatting with ICC members. This time it struck me when I was chatting with Simran. She was telling me that her mom makes the best Punjabi Mango Pickle and I said we should make it for the challenge if she can share the recipe with us. So here comes another new challenge for us. 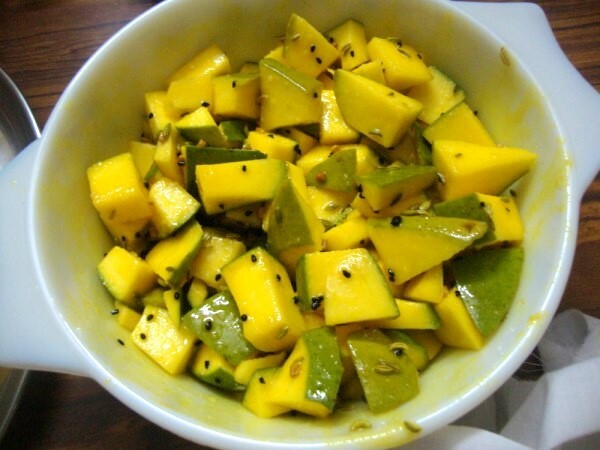 I selected mango as it’s the season here in India. I am extremely sorry if it is not so. Some were not able to do it because of this. I suggest you try it when you get it. Simran’s Mom gave the recipe for 5 kgs of raw mangoes. So I discussed with my Mom and got to scaled down to 1/2 kg of Mangoes. 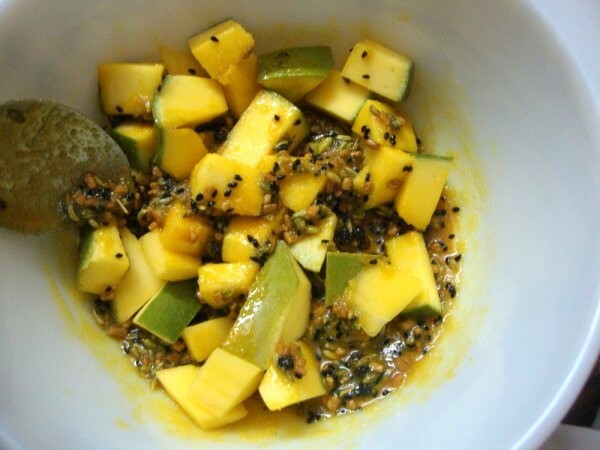 You can use about 17 oz of mangoes. 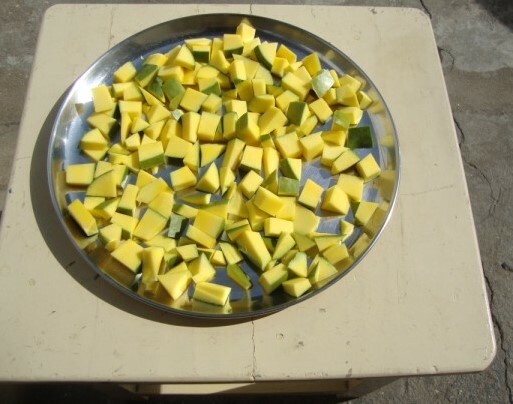 Amma scaled down recipe with 1/2 kg of raw mangoes, but I am giving the original proportions of 5 kg as shared by Simmi. We have a reason to celebrate this month. 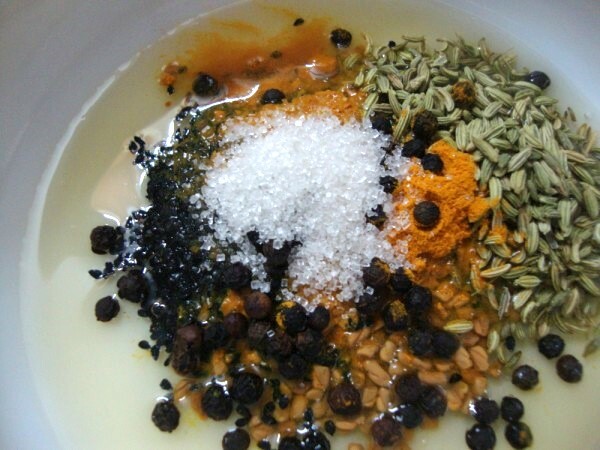 I started Indian Cooking Challenge in June 2009, and this challenge marks the completion of 2 years! I simply can’t believe we have this group still going strong. I would like to thank my members for all the support and enthusiasm shown over the months. It’s great to be part of such a wonderful group. My special thanks goes to Lataji, who has helped me in shortlisting and discussing many challenges. We have done over 25 challenges, will update with other stats shortly! Before getting into the recipe details, I must share my experience making this pickle. Since I selected this recipe ahead of time and since it also required standing time, I made sure I posted it on time. Also made sure I make it on time. Since I have never made pickle on my own, I asked Amma to get a mango and help me do it. 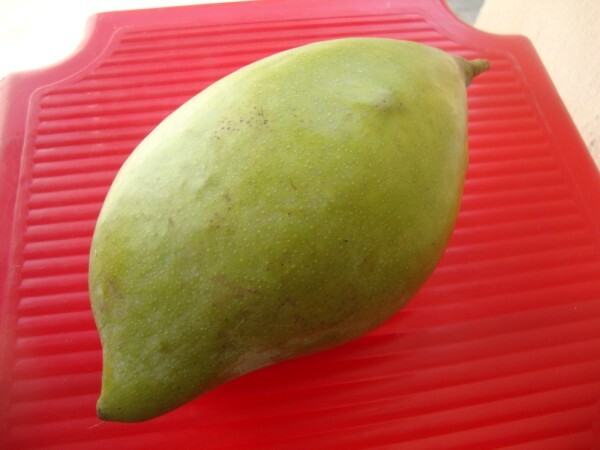 By the time we got down to making it, the mango got ripe. Then I got another one, this time making sure I had the weekend to get it done. I chopped the mango and had it dried, then realized I didn’t have any porcelain or glass jars to pickle. Only ceramic I had was a bowl. We added all the ingredients and kept it indoors, only to realize during the Sunday afternoon that I ought to keep it out. Dreading something but still proceeded to keep it out in Sun. I warned the kids that I have kept something out and they shouldn’t venture out. It was all about 10 mins nap but my boys along with my niece, were impatient to play outside and on top wanted the stool over which the bowl was sun dried. The stool was pulled an bang fell the bowl and along with it, the entire content down the drain! Ok this is the stool that Peddu is so fond of, this is something hubby dear got for me to use while taking the pictures, somehow Peddu has a great liking to it. It was Peddu who did it and he got good spanking for it too. Everybody scolded me for spanking him as it’s only a pickle that can be done again. And yes as always I ended up mopping over because I spanked Peddu. So after apologizing to him that I will not spank him again, I ended up making it again and this time made sure the kids weren’t around. 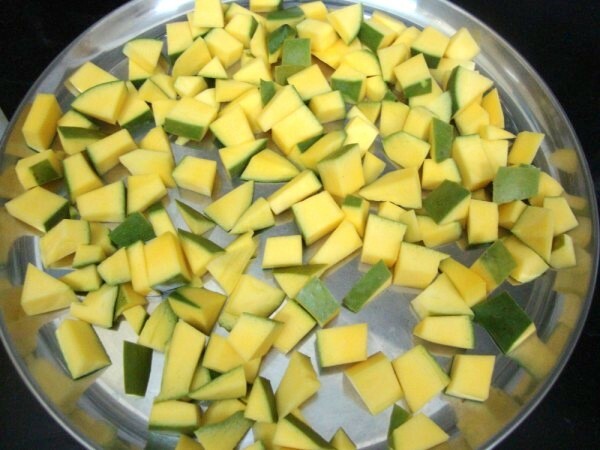 Wash 5 kg raw mangoes and wipe dry. 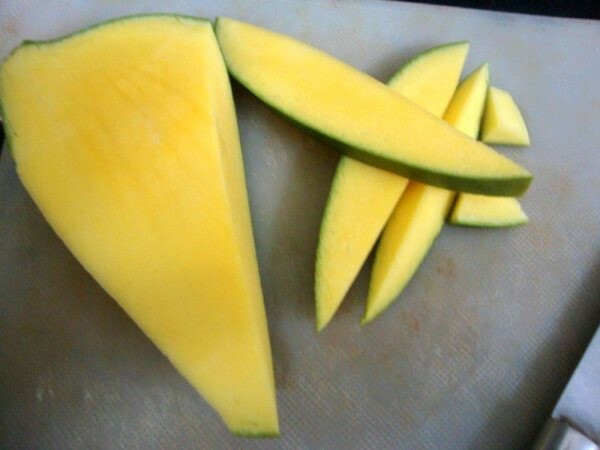 Halve the mango, remove the pit/stone and cut into 1 inch pieces. 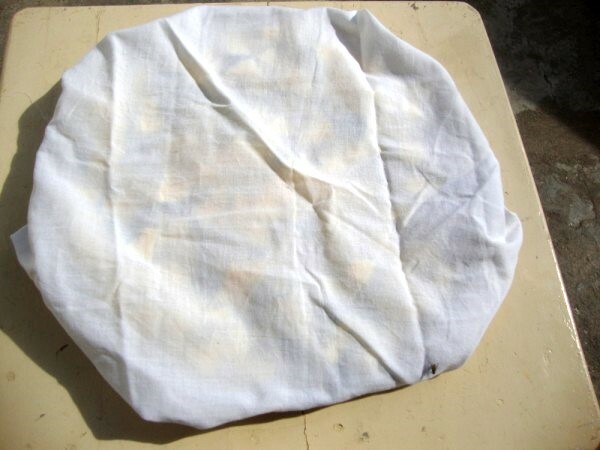 Dry in the sun for 2-3 hours (you can spread them out under a fan if you don’t get direct sunlight). At this point, you should also wash the porcelain/ceramic pickle jar that you need to use. Put it out in the sun to dry out any moisture. 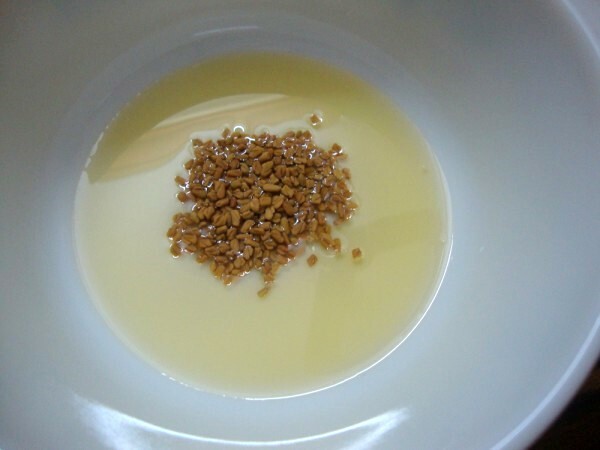 In a large pot, mix 250 ml mustard oil with the spices. 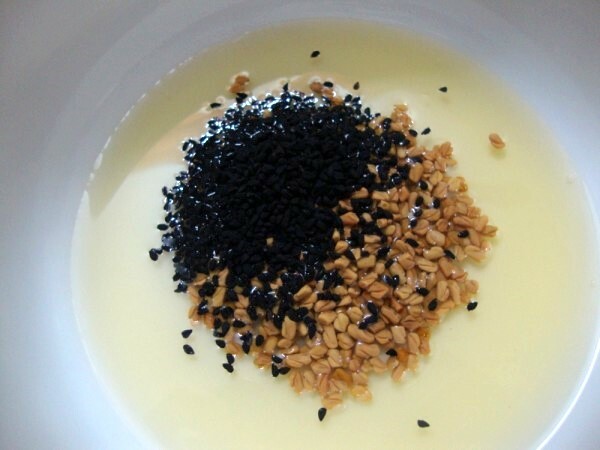 Add the mangoes and toss until they are well coated. 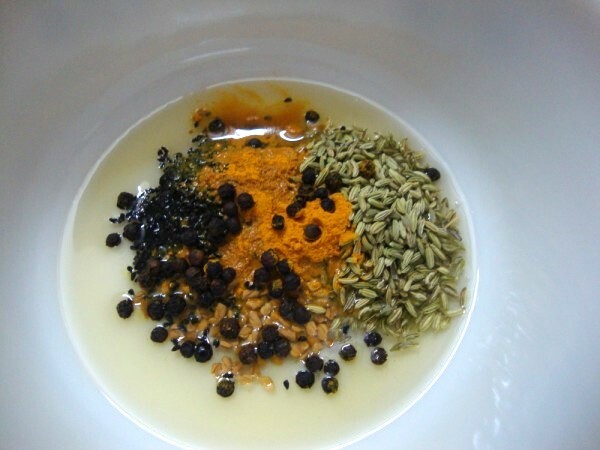 If you don’t have a big enough utensil, split your spice mix into 2-3 parts and do it in batches. Put it the jar (a glass jar will do if you don’t have ceramic, but no plastics or metal please). Keep the jar in the sun for a day. 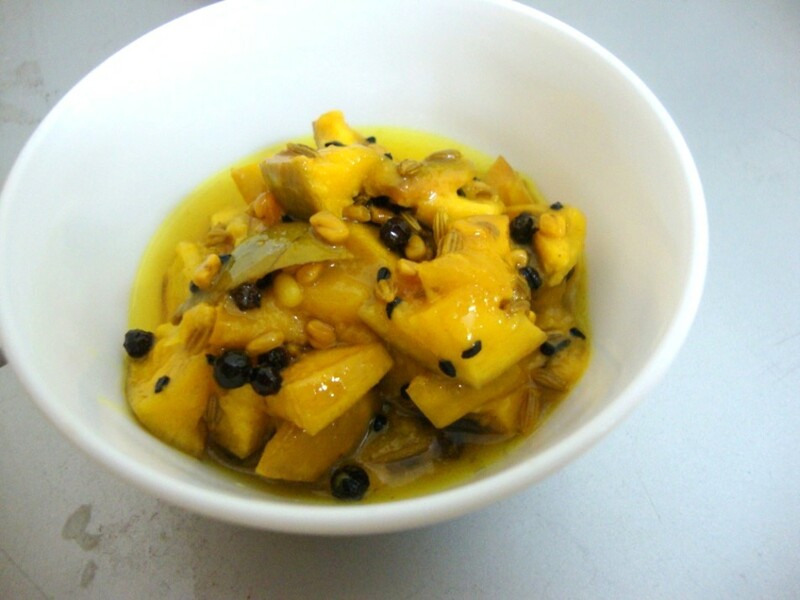 Then add enough mustard oil to cover the mangoes. While there’s nothing stopping you from eating this right away, the flavors will be much better blended if you wait 15-20 days. For these first 15 days, shake the jar once a day. After that, you can pretty much let it be and nothing will happen to your pickle for a year or two. 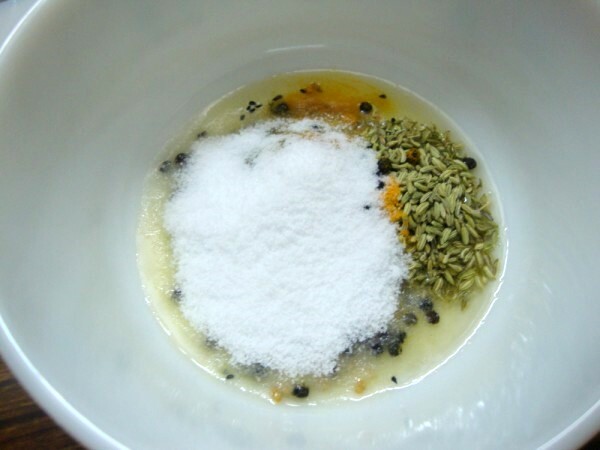 You can also add a tsp of sodium benzoate to the spice mix and it will help preserve the pickle for longer. 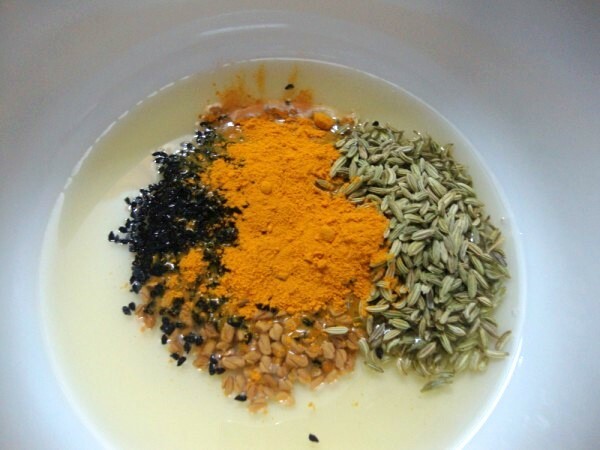 Notes: The spices are all added whole. 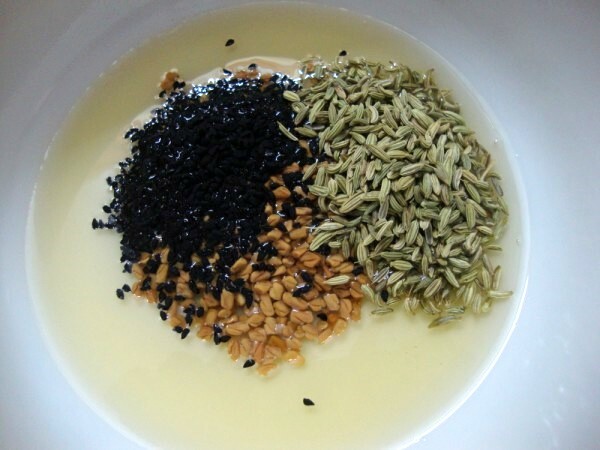 Kalonji and Fenugreek seeds are absolutely critical for the flavor. Also, you will notice there is no red chilli. This pickle is not a spicy one as the peppercorns are whole and will be spicy only when you bite into one. 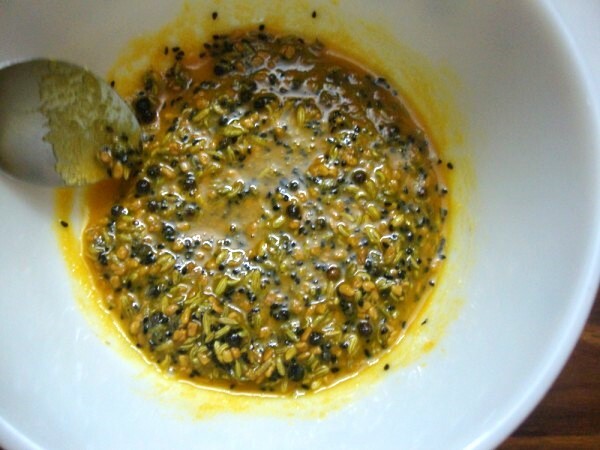 Verdict: Athamma liked it a lot, the methi, kalonji really added flavour. But as expected we might always prefer spicy pickle. But it’s good to taste a new one. Maybe next time I might add red chili powder too. 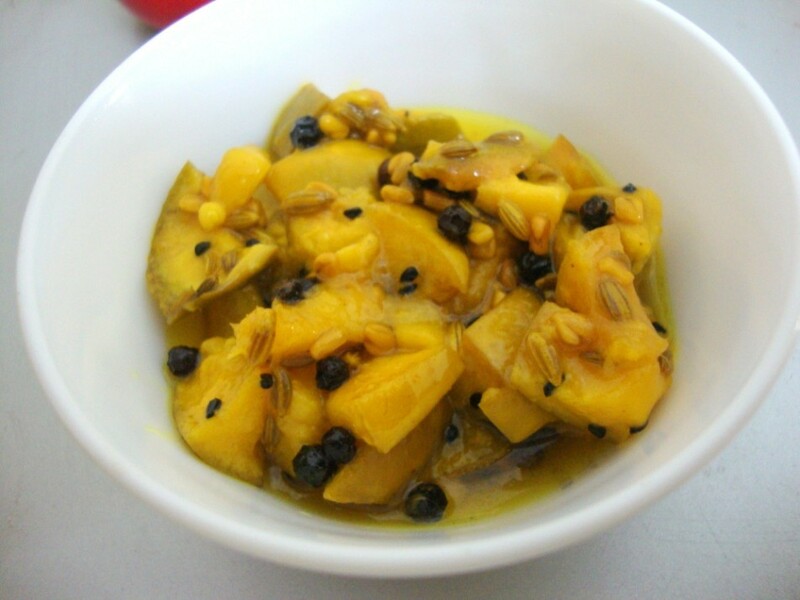 To all my ICC members, please link your Mango Pickle post to Mr. Linky. Ahhh, so that's what it's supposed to look like! My mangoes were very sweet and very soft, they just sort of pulverized and didn't turn out very well, not even worth posting! Might have to give it a try another time when I can do it right and see if it works out better. mine has been schedules Valli. 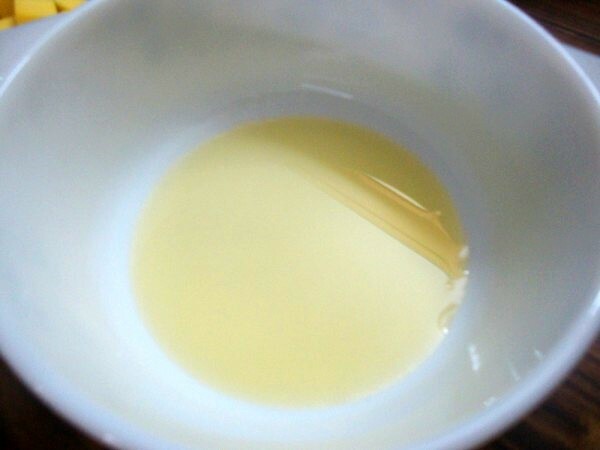 I made a very small quantity because the mangoes here are not very sour and suitable for pickle. Still it tasted good. 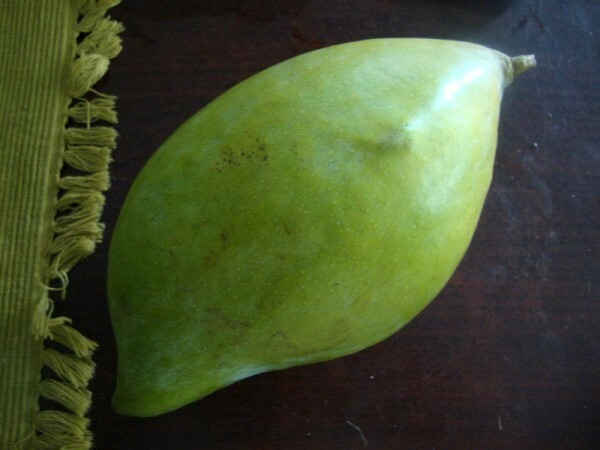 I can imagine how apt mango in your picture would have been for the pickle. 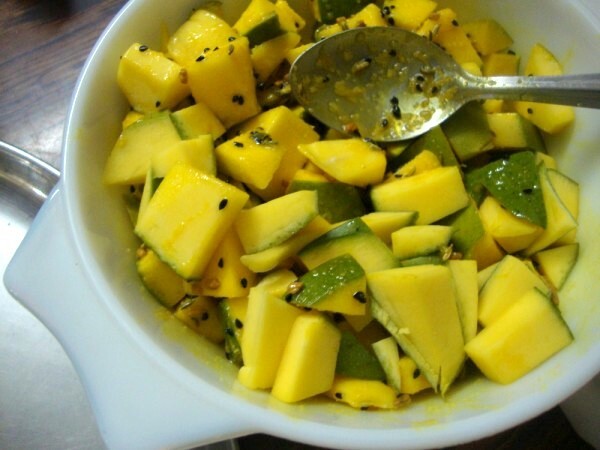 Lovely mango it looks great. I missed this month's challenge, but looks like everyone had fun making the pickle. Your's looks delicious. Loved reading the post. Nice One Valli.I enjoyed it thoroughly.Linked it.But the first one can you delete ? Coz'the url is old one.The second one is correct.Sorry for that .Thanks Valli. I should say I liked the spiced up oil more. Enjoyed this challenge. Just linked mine Valli. Loking forward to the next challenge! Your pickles have come out so perfect and delicious looking! I linked it right away, but not sure why it didn't take it. I linked it again, hopefully, this time it will register.